Having decided to buy a piano after a break of 5 or 6 years from playing I spent a good few months looking at various options the internet proving both a useful resource and also the old adage that a little bit of knowledge can be a dangerous thing! I quickly realised that I wasn’t going to be able to make an informed decision by simply researching the subject which led me to Ben, who of all the people I spoke to, I found the most impartial, friendly and knowledgeable and can recommend without hesitation. I spoke to Ben and outlined what I thought my dilemma was (did I buy an older Yamaha or a new Feurich?) and was really impressed by his approach which was simply to invite me up to the show room on a Saturday and let me play the pianos he had in stock. There was absolutely no pretension as to my playing ability (enthusiastic) or budget (initially very reasonable although I hadn’t played a Grotrian at that stage!) although it became clear that the pianos I had thought I wanted just didn’t feel right. Ben quickly picked up on this and suggested I try a few more he had in stock at the larger showroom. Initially slightly overwhelmed by the choice, Ben let me play pianos across the range carefully explaining the differences between each and patiently answering my questions without any time pressure or sales pitch. However I still couldn’t find one that felt right. Feeling slightly dismayed, I listened to Ben play a Grotrian Cristal and he suggested I have a go after which I was completely hooked! Despite trying to convince myself I could make do with one of the other pianos, I quickly realised I couldn’t and am now the very proud owner of a Cristal. 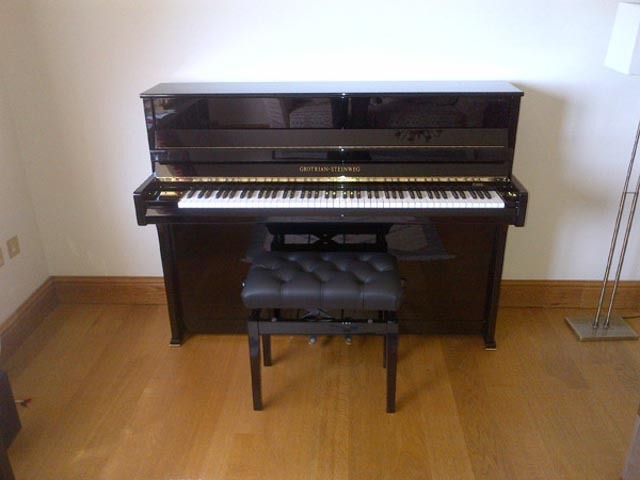 Ben was a pleasure to deal with throughout, from the initial visit though to ordering my piano and delivery. His enthusiasm for pianos is infectious, and his advice was completely invaluable. I can’t give any higher praise than to say that having dealt with Ben I wouldn’t consider purchasing a piano from anyone else!